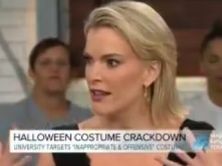 Tags: Apologies & Retractions, Fact Checking, Fake News, Kevin Deutsch, New York Times, Standards, Transparency, U.S. The New York Times' Feb. 25 print editor's note. New York Times editors reviewed a recent article about drug use on Long Island by freelancer Kevin Deutsch and was not able to find two of the people quoted in the story. According to his website, Deutsch is “an award-winning criminal justice reporter and author of two books.” His website states he was a staff reporter for the New York Daily News, The Miami Herald, The Palm Beach Post, Newsday and The Riverdale Press. 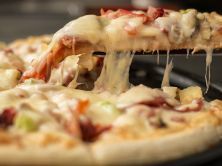 On Feb. 24, the Times published a lengthy editor’s note explaining that last month, the newspaper began its own in-house investigation after being contacted by the Sun. To have the Sun flag fundamental problems in a Times story that should have been caught by the Times itself raises doubts by readers about the newspaper’s reporting. 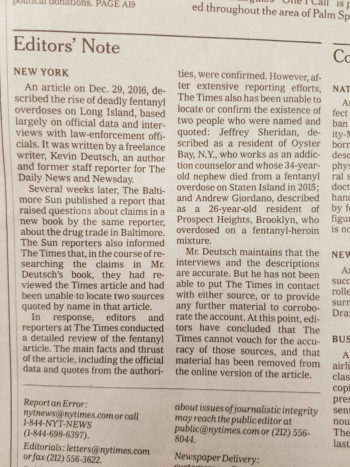 The Times wrote that during its “detailed review,” it could not “locate or confirm the existence” of two sources, Jeffrey Sheridan of Oyster Bay, N.Y., whose 34-year-old nephew reportedly died, and a 26-year-old man named Andrew Giordano of Prospect Heights, Brooklyn. When contacted by iMediaEthics, Deutsch did not respond on-the-record to our question about what information he provided to the Times to help them track down sources beyond ages, name and city locations in the article. He may have provided all he had but this was not enough for the Times to verify these men existed. iMediaEthics found the original article, pre-editor’s note, re-published through Press Reader. It shows that Jeffrey Sheridan’s nephew, a third apparently missing person in the article, was not named. 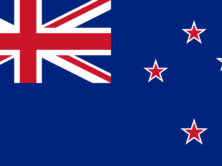 An archive of the story is available here. A screenshot of the Press Reader re-publication of the New York Times‘ article. iMediaEthics contacted the Times to ask for more information about what it means when the newspaper says it couldn’t track down the sourcing with Deutsch’s information. The New York Times‘ solution? The newspaper treated this case similarly to how it handled the Jayson Blair fabrication scandal, by appending an editor’s note. In this case, the note warns that the Times was unable to find the sources and that it scrubbed references to the two interviewees from Deutsch’s original article. iMediaEthics has asked Times public editor Liz Spayd what, if any, review she is conducting, and will update with any response. Does this fix the elephant-in-the-room problem of the sources who can’t be independently confirmed as real? iMediaEthics searched both sources’ names through Google and didn’t find results in the area. 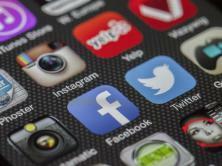 Despite this problem of verification, Deutsch told iMediaEthics by e-mail he stands by his reporting. He implies in this statement that there may have been some sort of confidentiality arrangement with his sources. This does not seem credible given that there was no indication in the story that their names or locations had been changed for privacy or a statement of anonymity was provided, as required by Times anonymous source guidelines. Did Deutsch have real sources but fail to fact check their identities, addresses and other information? What was the deceased nephew’s name? Was a death record checked? Further, any anonymity, according to Times guidelines, would have required an editor knowing the real names of the sources, even if they were not included in the story. Because the Times was surprised by the Sun’s questions being raised, no anonymity deal must have been in place. We asked the Times if it verified the existence of the 12-step meetings or the nephew’s existence, but the Times wouldn’t comment beyond its editor’s note. Deutsch called it “disheartening” to have other journalists question and criticize his reporting, suggesting it was because of competition and not for his own reporting failures. 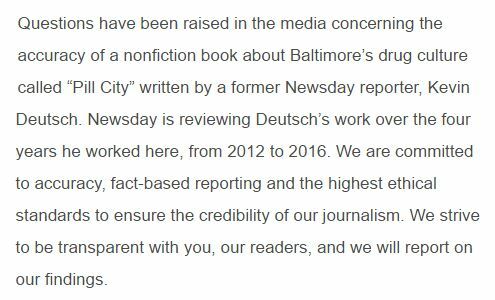 Uncorking further doubts about his journalism, Newsday, where Deutsch worked from 2012 to 2016, is also “scrutinizing his work for any inconsistencies,” its managing editor Richard Rosen told the Baltimore Sun earlier this month. “An article on Dec. 29, 2016, described the rise of deadly fentanyl overdoses on Long Island, based largely on official data and interviews with law­ enforcement officials. It was written by a freelance writer, Kevin Deutsch, an author and former staff reporter for The Daily News and Newsday. “Several weeks later, The Baltimore Sun published a report that raised questions about claims in a new book by the same reporter, about the drug trade in Baltimore. The Sun reporters also informed The Times that, in the course of researching the claims in Mr. Deutsch’s book, they had reviewed the Times article and had been unable to locate two sources quoted by name in that article. “In response, editors and reporters at The Times conducted a detailed review of the fentanyl article. The main facts and thrust of the article, including the official data and quotes from the authorities, were confirmed. 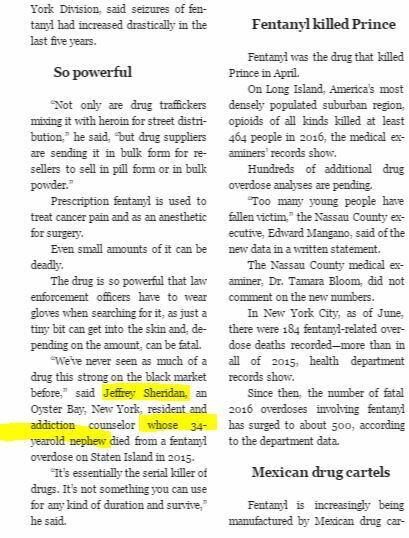 However, after extensive reporting efforts, The Times also has been unable to locate or confirm the existence of two people who were named and quoted: Jeffrey Sheridan, described as a resident of Oyster Bay, N.Y., who works as addiction counselor and whose 34 ­year ­old nephew died from a fentanyl overdose on Staten Island in 2015; and Andrew Giordano, described as a 26 ­year ­old resident of Prospect Heights, Brooklyn, who overdosed on a fentanyl ­heroin mixture. UPDATED: 3/1/2017 9:53 AM EST With Deutsch’s background. UPDATED: 3/2/2017: 4:48 PM EST See our follow-up story, “Exclusive: 572 Stories by Fmr NY Daily News Crime Reporter Under Review After NYT Admits Source Fail,” here. According to the Times’ editor’s note, it was Baltimore Sun reporters not editors who contacted the NYTimes.